It's only 764 characters. We strongly recommend writing at least 1.000 characters. Use content that makes your app unique (features description, characteristics, how to use your app, ...). Your description needs to convince people to download your app. Also, be sure to add important and relevant keywords in your description to improve your iTunes app page and optimize your SEO. Your app's last version was released on April 20, 2016. It is important to regularly update your app. Best practices recommend to update your app every 4 to 6 weeks. This means fixing reported bugs, improving existing features, launching new features etc. Keep an eye on users' feedback. The next great features may already be asked by many users. 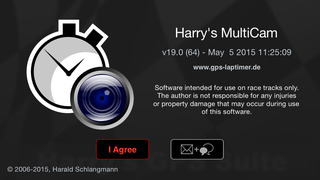 Harry's MultiCam is a companion app for Harry's Suite of GPS apps. It features fully automated, and event triggered video recording. 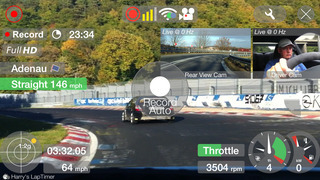 Footage recorded is in sync with recordings collected by a master app like Harry's GPS LapTimer Grand Prix edition. With footage being in sync, it is very easy to combine it as picture in picture video later. Master apps can control several MultiCam apps at the same time.